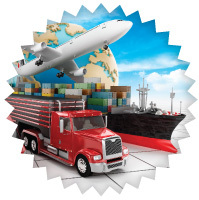 Transportation Systems provides a complete operational understanding of all available transportation modes, intermodalism, and the vital supporting services, agencies, and implementation factors involved in freight management. Learners gain the ability to quickly adapt to changing conditions, managing the transportation of raw materials and goods to or from international destinations as well as across Canada's complex geography—choosing the safest and most cost-effective and time-appropriate mode or combinations of modes. Providing the deepest coverage of this specialized field of any course available to industry, Transportation Systems provides the best foundation of knowledge for anyone who buys, sells or manages the flow of goods and product—or is impacted by transportation logistics. Take Logistics Processes as the complement to this course. Then add other specialized logistics courses to deepen your understanding. Transportation Systems helps professionals streamline decision-making to minimize errors that can lead to longer transit times, increased costs of transit, unnecessary inventory carrying cost, fines for non-compliance, and increased handling and damage. Understand and capitalize on the comparative efficiencies of various modes of transportation (rail, road, air, water and pipeline) and the procedures and documentation required for each. Streamline the process of getting product to market, optimizing the secondary transportation services that compliment intra-modal and inter-modal supply chain operations. Optimize the use of specialized intermediaries (freight forwarders, transportation brokers, customs brokers), knowing when to use them, how to evaluate their cost and quality and learn ways to minimize the time spent coordinating their services. Apply operational insight to negotiate more effectively and confidently with all stakeholder groups. Reduce or avoid personal and corporate exposure to fines, seizure of goods, environmental damage and criminal charges by recognizing relevant safety standards and transportation legislation, including the Transportation of Dangerous Goods Act. Over 80% of course grads say they can apply learning from Transportation Systems in their daily work. "With today’s global competition, the margin for error is very small. Transportation Systems can help you maintain your competitive advantage." There is an additional International Fee of $125 plus 5% GST per course for students taking the course from outside Canada. There are no refunds issued for courses taken directly through CITT once your registration and payment has been received and processed. Please note: This only applies to courses taken directly through CITT. Fees for CITT courses taken through our partner educational institutions are set by those institutions. 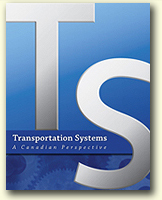 Your course textbook, Transportation Systems: A Canadian Perspective, is published by CITT. A printed copy of the textbook plus access to PDF chapters on your course website is included in the $800 course registration fee. There is a $50 discount available if you opt to use the PDF chapters only. Please note: This only applies to courses taken directly through CITT. Textbook fees for CITT courses taken through our partner educational institutions are set by those institutions. On average, students tell us that this course requires a commitment of 4-8 hours a week to complete the readings and assignments, participate in discussions, and prepare for the final examination. Students complete 10 short quizzes (one per week) throughout the course of the semester. There is one quiz for each chapter in the Transportation Systems textbook, and each quiz includes 10 multiple choice questions. Each weekly quiz is due at 11:59 pm EDT each Sunday. Quizzes can be completed early for learners who need to plan ahead for business travel, vacations or other commitments, but must be completed before their individual deadlines. During the semester, students will participate in 2 online group discussion assignments. The first discussion will take place over the course of the first 5 weeks of the semester. The second will take place during the next 5 weeks. These online discussions engage students in reflection, dialogue and debate, challenge you to apply the course material in real world business scenarios, and enable you to learn from your classmates and facilitator in addition to the course materials. Group discussion assignment marks are based on the quality, quantity and timeliness of your responses in the discussions. In general, students are expected to contribute 3-4 high-level comments to each discussion. The major project for Transportation Systems is the preparation of a report based on a business case study scenario and questions. Learners are challenged to analyze the scenario provided, and apply the skills and knowledge gained throughout the course to prepare a detailed 10-12 page report including a high-level executive summary. These questions are based on a case study that is circulated to all learners one week prior to the exam date, and involves applying the knowledge learned throughout the course to that scenario. The final exam period runs over the course of several days at the end of the semester. You can choose any (continuous) 2.5 hour window of time to begin & complete your exam during the exam period. Once exam period dates have been set for each semester they are available on the Key Dates page. This exam requires access to a computer with a reliable internet connection. In order to reduce the chances of technical issues, learners should use the Firefox web browser. Approximately one month after the final exam, you will receive your course results from CITT. Although the learning materials and course site are in English, a francophone facilitator is available and learners have the option of completing the formal report and answering exam questions in French if they desire. Questions about Transportation Systems or the CCLP program of study and professional designation?